Courtesy of the Pittsburgh Post-Gazette | Coach Jim Ferry with freshman guard, Mike Lewis II. Welcome to A10 Talk’s Top 14 Coach Countdown of the 2016-17 season. We like to rank the players of the A-10 each season, but we’d also like to take a look at the brains of the operations. Who were the best coaches of the 2016-17 season? Who were the worst? Our site voted and compiled a list based on last season alone. This list is representative of how well each coach performed in the 2016-17 season, not in his entire career. Today, we feature #14 Jim Ferry. On February 15, Duquesne hosted fellow A-10 cellar dwelled UMass. On the heels of an eight-game losing streak, the Dukes were due for a win, and proceeded to take out all of their pent-up frustrations on the Minutemen. Not only was this the Duke’s best win of the season, but freshmen Mike Lewis II and Isiaha Mike combined for 54 points in the victory. After missing his first six shots, Lewis connected on his final eight en route to a 31-point performance, which tied the second-most points in a game ever scored by a Duquesne freshman. February 15’s win was a microcosm of what was possible when both freshmen were playing well. Unheralded coming out of high school, Ferry took a chance on both Lewis and Mike, and on nights like February 15, they made Ferry look like a genius. On December 2, Duquesne beat Pitt 64-55 in the annual City Game. Graduate transfer Emile Blackman led the Dukes with 21 points, and Mike Lewis added 15 of his own. The win was the program’s first in the series since December of 2000, ending a 15-game losing streak to Pitt. As the game ended, Duquesne’s red-clad student section bled onto the floor of the neutral-site PPG Paints Arena to celebrate the Dukes’ victory over an, albeit lowly, Pitt team. Certainly the highlight of the 2016-17 season, the win signified the potential turning of the page for Duquesne’s program in the Ferry era. Considering all of the lowly teams that Duquesne lost to in their non-conference slate and how many times they were embarrassed by A10 competition (See: 90-53 loss at Dayton on February 4), a close loss to a decent NEC team on a neutral court doesn’t seem particularly awful. However, considering the Dukes had just beaten Pitt on the same court four nights earlier, the loss to regional rival Robert Morris couldn’t have come at a more inopportune time. Duquesne had just beaten Pitt for the first time in sixteen years, and then lost every ounce of momentum that they may have had by losing to their other area rival four nights later. Of course, the energy in the building wasn’t going to be the same (sadly, it was a predominately Robert Morris crowd), but to have the wind sucked out of your sails that quickly was telling of the type of season that Duquesne was going to have. Duquesne’s loss to Rhody on January 21 wasn’t particularly embarrassing, given the talented Rams squad was that would go on to win the A10 Tournament. However, the game stuck out to me as a visible lack of effort on behalf of the Red & Blue. Duquesne turned the ball over 14 times, only forced four Rhode Island turnovers, and allowed 21 second-chance points. The Saturday afternoon game in the barren A.J. Palumbo Center saw the Dukes display lackluster defensive effort and shoot a subpar 39.7 percent from the field. Leading by as much as 18 with 15:03 left to play, Duquesne seemed sure to defeat eleventh-seeded Saint Louis and move on to the next round of the A10 Tournament. Even after the Billikens mounted a comeback, Duquesne still looked like they’d move on to the second round of the tournament when they took a five-point lead with 24 seconds to go after a pair of Mike Lewis free throws. Saint Louis guard Mike Crawford scored on a layup, and then Duquesne turned the ball over while trying to inbound the ball, setting up another Crawford basket to cut the lead to one. Duquesne wing Emile Blackman, a 77 percent free throw shooter, missed two free throws, setting up the Billikens for the final possession. Davell Roby would score a put back on a missed Jalen Johnson layup with :01.6 remaining in the game, ending Duquesne’s season and Jim Ferry’s run as Duquesne’s head coach. To be fair, firing Jim Ferry looked like a ginormous mistake for about two weeks. 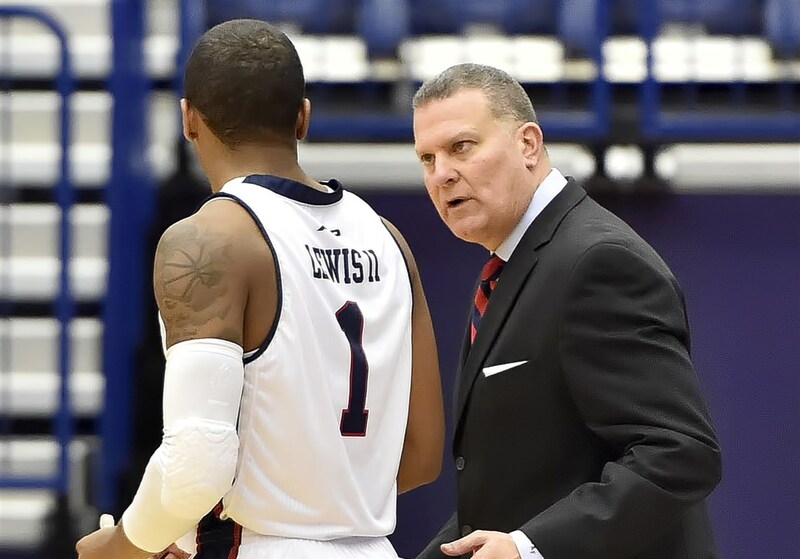 Duquesne broke the news of Ferry’s firing, and then proceeded to conduct one of the most memorable – and embarrassing – coaching searches in recent memory. Over a two-week period, Duquesne was linked to Monmouth’s King Rice, Vermont’s John Becker, Michigan State assistant head coach Dane Fife and Ball State’s James Whitford, all to no avail. Mark Titus, a writer for The Ringer and former Ohio State walk-on, even jokingly auditioned publicly for the job. In addition to public ridicule, Mike Lewis and Isiaha Mike were among the players to request their releases from the university, and Duquesne lost all three of Ferry’s solid recruits. Mike Lewis would end up recommitting to Duquesne, but four others have transferred; namely, Isiaha Mike (to SMU), Nakye Sanders, Rene Castro and Spencer Littleson. Three-star guard Jamari Wheeler, forward John Walker III and forward Lewis Djonkam were all released from their NLI’s as well. Wheeler and Djonkam have since recommitted; Wheeler to Penn State, and Djonkam to VCU, respectively. It wasn’t until Akron’s Keith Dambrot was hired that Duquesne looked like they knew what they were doing. Hired to resurrect the Duquesne program, Dambrot has already begun to reconstruct the roster to his liking. The general consensus is that Duquesne may have finally gotten it right with their head coach. As for Ferry, there’s been no news on his next endeavor. He was originally linked to Quinnipiac’s head coach opening, but Quinnipiac has since hired Villanova assistant coach Baker Dunleavy to take over. Adam Lindner is an undeclared sophomore at Duquesne University. On campus, Adam acts as the Sports Editor of Duquesne's student-run newspaper, The Duquesne Duke. You can follow him on Twitter @DuqDuke_Sports or on Instagram @adamlindner.